﻿ Sonderbooks Book Review of "Shouldn't You Be in School?" Little, Brown and Company, New York, 2014. 325 pages. I wish I could have listened to this book, like I did the first two "Wrong Questions." The narrator reads them with the perfect crime noir voice. However, reading the book has the advantage that I could enjoy the illustrations and that now I can quote bits. This book is wonderfully clever. The plotting is complex, and you definitely should read the first two books first. In fact, I may have missed some crucial information by not yet reading File Under: 13 Suspicious Incidents. Though this book says it is number 3, so I probably was just forgetting some details, because it had been awhile since I listened to the first two books. "Shouldn't You Be in School?" 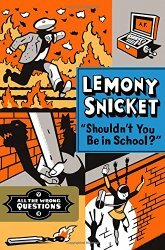 is a question that 13-year-old Lemony Snicket gets asked several times in this book, as he continues to investigate suspicious incidents in the town of Stain'd-by-the-Sea. Right from the beginning, there are instances of arson and evidence of a further plot by Hangfire. And several people in the town seem to be aiding Hangfire. Whom can young Snicket trust? The author's tone is delightful. I love the way he defines words and then they come up over and over again. In this book, the term "fragmentary plot" comes up over and over again, as he assembles a team of schoolchildren to help him, and each one has a part in the plan. There was a town, and there was a librarian, and there was a fire. While I was in town I was hired to investigate this fire, and I thought the librarian could help me bring a villain to justice. I was almost thirteen and I was wrong. I was wrong about all of it. I should have asked the question "Why would someone destroy one building when they really wanted to destroy another?" Instead, I asked the wrong questions -- four wrong questions, more or less. This is the account of the third. We learn more bits about Lemony Snicket's background in this book, and he works on thwarting one part of Hangfire's plot. He gains some excellent allies in this episode. But overall enlightenment about what's going on? I'll be waiting eagerly for the fourth book. This day was no different. It was like all the other days during my time in Stain'd-by-the-Sea, where every person had a secret, and beneath all the secrets was a great, slippery mystery, like a creature lurking in the depths of the sea.